You may not know it, but whenever you eat cheese, ice cream, or yogurt, you are also ingesting microscopic lipid droplets. Long thought of merely as formless blobs of fat, lipids are now proving crucial for understanding how embryos survive and how obesity affects the body. Rochester biologist Michael Welte and his team made their discovery while studying the internal mechanisms of the egg cell of the fruit fly, known as Drosophila. What keeps the assembly line functioning—based on the new research—is a protein called Klar. 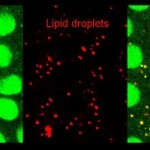 Findings on the cellular-level regulation of proteins called histones by lipid droplets, or “fat depots,” shines light on chromosome production – and possible manipulation of that process. Histones are proteins needed to assemble DNA molecules into chromosomes. New research at the University of Rochester is causing a fundamental shift in the concept of histone balance and the mechanism behind it.